On the tail of Old School Renaissance has come another movement—the rise of the fanzine. Although the fanzine—a nonprofessional and nonofficial publication produced by fans of a particular cultural phenomenon, got its start in Science Fiction fandom, in the gaming hobby it began with Chess and Diplomacy fanzines before finding fertile ground in the roleplaying hobby in the 1970s. Here these amateurish publications allowed the hobby a public space for two things. First, they were somewhere that the hobby could voice opinions and ideas that lay outside those of a game’s publisher. Second, in the Golden Age of roleplaying when the Dungeon Masters were expected to create their own settings and adventures, they also provided a rough and ready source of support for the game of your choice. Many also served as vehicles for the fanzine editor’s house campaign and thus they showed another DM and group played said game. This would often change over time if a fanzine accepted submissions. Initially, fanzines were primarily dedicated to the big three RPGs of the 1970s—Dungeons & Dragons, RuneQuest, and Traveller—but fanzines have appeared dedicated to other RPGs since, some of which helped keep a game popular in the face of no official support. Since 2008 with the publication of Fight On #1, the Old School Renaissance has had its own fanzines. The advantage of the Old School Renaissance is that the various Retroclones draw from the same source and thus one Dungeons & Dragons-style RPG is tcompatible with another. This means that the contents of one fanzine will compatible with the Retroclone that you already run and play even if not specifically written for it. 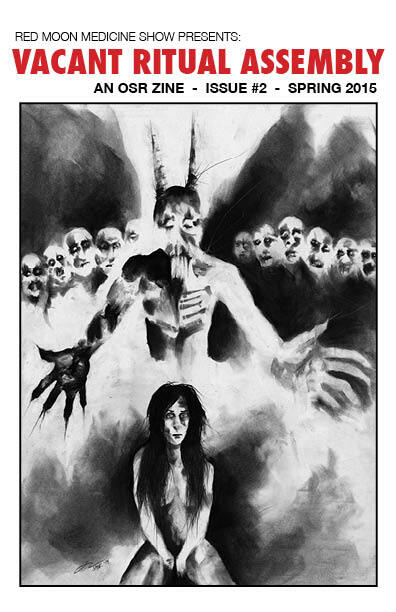 Labyrinth Lord and Lamentations of the Flame Princess Weird Fantasy Roleplay have proved to be popular choices to base fanzines around, such as The Undercroft and Vacant Ritual Assembly. Published in the Spring of 2015 by Red Moon Medicine, Vacant Ritual Assembly #2 follows on from the solidly done issue #1 and like that first issue is devoted to Lamentations of the Flame Princess Weird Fantasy Roleplay and the campaign of the editor, Clint Krause. Unlike that first issue there is no real theme to Vacant Ritual Assembly #2, but this does not mean that the contents of this issue suffer for it. Once past the editorial and the editor’s campaign update, Vacant Ritual Assembly #2 opens with a pair of slight pieces, a list of names for a dark fantasy game and a reinterpretation of the Zodiac as part of character creation. This is followed by ‘Dretcher’s Bay’, a description of a forlorn, Innsmouth-like hamlet. Governed by ‘the captains’, the village is best known for the Bell Crab, the rich meat of which sells for high prices. Each of the captains commands rival crews of crabbers that dive upon the nearby submerged ruins of Acray to harvest the crabs, though the creatures are sacred to the strange lobster-like Nephroids who herd them. The description of Dretcher's Bay does not include any plot hooks or scenario ideas, but the setting itself has plenty of opportunities, whether the player characters want to get involved in village politics, dive for Bell Crabs, or scour the ruins for its secrets. It feels old and mouldering and is easily dropped onto any suitable coastal spot in a Referee’s campaign. The only piece in Vacant Ritual Assembly #2 offered by an author other than the editor is ‘Oarsmen & Their Woes’ by Anxious P. This describes a strange Charon-like race that might be encountered singly when someone needs to escape from a situation or environment. The Oarsman offers a way to somewhere safe—or at least somewhere safer—aboard his ferry along impossible creeks, but there is a price. The Oarsman will not only share the woe that lead to him becoming an Oarsman, but also demand a price for their passage to be paid by one of the adventurers. This is usually something personal and vital to the adventurer. ‘Oarsmen & Their Woes’ offers both something useful and something creepy to a campaign and really works if used more than once because no two woes and no two prices should be alike. To that end, a few more suggested prices might not have gone amiss, but a competent Referee should be able to devise a few more. ‘With Thine Eye Beheld’ offers a short encounter with a strange cargo cult obsessed with a cyclops-God and his eye. It details the small, family cult and its temple, essentially a small dungeon. There is relatively little to the scenario, but it carries its eye motive as far as it can in a few pages, right up to a sort of bonkers magic item. Just as ‘Dretcher's Bay’, this scenario lacks the hooks to get the adventurers involved, but unlike ‘Dretcher's Bay’, this scenario lacks the depth for the Referee to really develop interesting hooks. So the Referee will need to work harder to work it into his game, but it is nevertheless easy to drop ‘With Thine Eye Beheld’ into a hex of your sandbox. As with the first issue, rounding out Vacant Ritual Assembly #2 is a lengthy interview. This time it is with Greg Gorgonmilk, the co-author and publisher of Dolmenwood - Character Archaics. It is informative, but at six pages, it is somewhat lengthy given that the fanzine is just twenty-four pages long. Essentially it is a magazine-sized article and perhaps it could have been split over two issues? Physically, Vacant Ritual Assembly #2 is well presented, and there are decent maps whilst the illustrations do vary in quality. Where second issues—whether of albums or fanzines—might seem to have a difficult gestation with ultimately unsatisfactorily results, this is not the case with the Vacant Ritual Assembly #2. It contains some satisfying and usable content in both scenarios, an interesting creature to encounter, and even page filling pieces that can be used. Overall, a solid issue with a few problems which can easily be overcome for issue #3.